Eddie’s 83rd birthday will be his last; he is about to be killed by the amusement park rides he has maintained for most of his life. As he journeys through the afterlife, Edward meets the five people who affected, or were affected by his troubled existence. Visitations into Eddie’s life contextualise the heavenly odyssey and give depth to his characterisation. Although the central idea of a heavenly plane provided to “make sense of your yesterdays” is quaint, it is not well enough executed to be as profound as intended. Nevertheless this sentimental, short narrative is touching and easy to read. 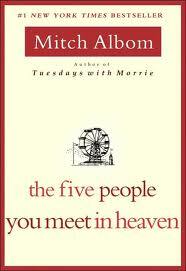 You are currently reading The Five People you Meet in Heaven by Mitch Ablom (Book Review) at booksbeccabuys.